With a number of recent malware infections spreading through the means of social engineering and infected USB drives, there are a few methods available to protect yourself. The most common way that organizations have been protecting themselves from this rising threat is through Group Policy and disabling the autorun/autoplay features of Windows. This makes it a little less user-friendly but a lot more secure. There are a lot more computers out there than those connected to a domain, so how can they easily put some protection in place to stop the attacks that are taking advantage of autorun? Besides tweaking some Registry settings, there is no an open-source project called No Autorun out there that aims to simplify securing the autorun setting. No Autorun is hosted over at SourceForge and is available in the form of a tiny executable for 32-bit or 64-bit Windows PCs. When you download and run the No Autorun executable, you’ll get a small System Tray icon and you’ll start off seeing the Settings window. You can configure and customize No Autorun to get the behavior you need out of it, if you need to change away from the defaults. Once you OK the settings for the first time, that window will disappear and you’ll see the main No Autorun window. This window will reflect any changes it’s made like locking suspicious files found on an inserted USB drive. When a file is found, you can then delete it or quarantine it. Another nice feature of No Autorun is its ability to control a USB Disk Soft Write Protect (enabled or disabled). 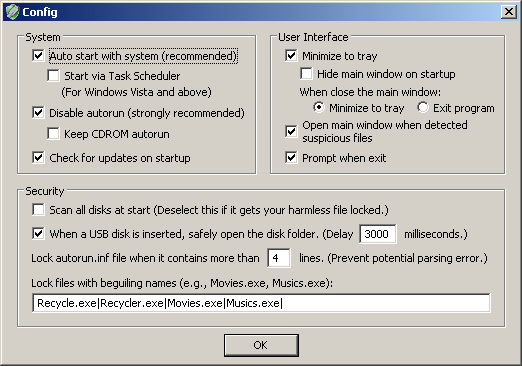 You can download the No Autorun application and improve your security against infected USB drives.